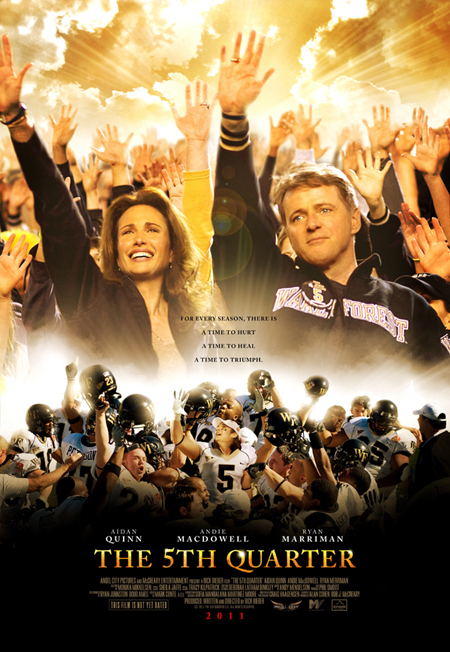 Moraga, CA, Jan 13th, 2011 – The 13th Annual California Independent Film Festival will kick off with the award winning film “The 5th Quarter”. The seven-day festival is launched on Friday January 28th with an Opening Night Celebration presented by Lamorinda. The evening’s festivities begin at 5:00 PM at a VIP Reception with celebrity guests at the New Rheem Theatre, 350 Park Street, Moraga. Ryan Merriman will be attending the screening of "The 5th Quarter"
Ryan Merriman will be attending the screening of “The 5th Quarter”Following the reception and beginning at 6:30 PM will be the opening night movie, “The 5th Quarter” which received rave reviews at other film festivals around the country, including Boston Film Festival, Heartland Film Festival and Charleston International Film Festival. “The 5th Quarter” is based on a true story. 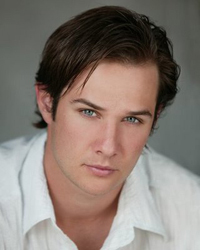 After his brother Luke was tragically killed in a car crash, Jon Abbate (Ryan Merriman) is driven to lead the Wake Forest Demon Deacons to their most successful football season in the school’s history. Wearing his brother’s number on his jersey, he accomplishes that, and establishes traditions along the way. The film starring Aidan Quinn, Andie McDowell, Jillian Batherson and Ryan Merriman (scheduled to attend). The film’s director, Rick Bieber, is also scheduled to attend the event. The 13th Annual California Independent Film Festival runs January 28th – February 3rd 2011 at the New Rheem Theatre. Purchase your tickets today online at http://www.caiff.org/, or at the New Rheem Theatre Box Office at 350 Park Street, Moraga. For festival’s information call 925-388-0752 or e-mail info@caiff.org . 2011 sponsors include the Winchell Family, Murdy Foundation/David Trotter, Diablo Magazine, Walnut Creek Marriott, CouldB Music, Senior Solutions, New Rheem Theatre, Lamorinda Weekly, and Lamorinda Wine Growers Association. Opening Night is sponsored by Lamorinda Weekly. Moraga, CA (Jan 6th, 2011) – Renaissance is once again celebrated at the New Rheem Theatre in Moraga, California. The 13th Annual California Independent Film Festival (CAIFF) takes center stage this month at its new home in the art deco style New Rheem Theatre. From Jan 28th – Feb 3rd, 2011, over 65 films from around the world are scheduled to be screened in one of Northern California’s premier film festivals. The seven-day festival begins with an opening night reception on Jan 28th followed by the screening of a film, “The 5th Quarter”– inspired by a special bond between brothers and their love for football, and with a poignant mission. Driven by the tragic death of his younger brother, Jon Abbate helped lead the Wake Forest Demon Deacons to their most successful season in school history in 2006, including an appearance in the Orange Bowl in January 2007. It stars Aidan Quinn, Andie McDowell, Jillian Batherson and Ryan Merriman. This is a red carpet event, with Ryan Merriman (“Home of the Giants”, “Final Destination 3”), and film’s director Richard Bieber in attendance. The next featured film for the evening is “Fanny, Annie & Danny”, which is comedic, and will make everyone laugh, loathe, and cry. It is a captivating funny tale of family dysfunction. The film’s San Francisco-based writer/director, Chris Brown, who has won raving reviews as a filmmaker, will also be in attendance. The opening night screening also offers an opportunity for avid moviegoers to participate in a question and answer session with the casts of each film. On Saturday, Jan 29th, the festival begins screening a rich and diverse program of films from around the world. CAIFF will also host the Iron Filmmaker Contest, an integral part of the festival for the past eight years. This competition challenges novice and seasoned filmmakers to create a three-minute film within 24 hours, incorporating a secret ingredient into the screenplay. The first 20 entries will be screened on the same day at the New Rheem Theatre. In terms of feature films, the festival will screen “Language of A Broken Heart” – about a bestselling, neurotic love novelist who re-tells the story of his failed relationships and all the women that left him, only to return home to the one person he ever left, his mother. At home, he meets a quirky antiquarian bookseller who shows him what love really means. It is a charmingly funny account of love, hate, and everything in between. The festival also presents another feature film, “The Yankles” – about Charlie Jones, a professional baseball player who was released from the Los Angeles Spirits because of a drinking problem. Upon being paroled from prison after serving time for his third drunk driving conviction, Charlie endeavors to serve 192 hours mandatory community service by coaching baseball. To Charlie’s dismay, however, he is shunned by mainstream society because of the controversy surrounding his early parole and prior convictions. Charlie soon discovers that the only people willing to give him a second chance are a group of Jewish, orthodox, yeshiva students who formed an upstart baseball team called The Yankles. A feature film from Tokyo, Japan, “Cast Me If You Can”, will also be screened. It is about a perpetual supporting actor, living in the shadow of his famous playwright father, gets his break when cast in a Woody Allen remake, but a chance encounter with his muse turns his world upside down. Definitely, it is a sweet, subtle romantic comedy for all generations. Two popular seminars are also being offered to the general public. One of which is “What Makes A Great Short Film” with guest speaker, Jana Sue Memel, who has produced and won academy award winning films. The other one is “How To Get Music in Film and Television” with guest speakers Senior MTV Vice President, Ken Parks, and Music Supervisor, Matt Kierscht. Among the highlights of Saturday’s events will be a special appearance by the Golden Globe Award Nominee, Lou Diamond Phillips, star of the famous films, “La Bamba” and “Stand and Deliver”. For festival attendees looking for more opportunity to schmooze with Mr. Phillips on Saturday evening, CAIFF has also organized the M3 Party (Meet, Mix, & Mingle Party). People can enjoy and savor filmic conversations with filmmakers and celebrities from around the globe. On Sunday, Jan 30th, the highlights include the “Academy Awards of the Bay Area” – the 2011 CAIFF Gala & Slate Awards held this year at the Marriott Hotel in Walnut Creek, CA. This year’s film festival honors Academy Award recipient Shirley Jones (“Elmer Gantry”, “The Partridge Family”) with its 2011 CAIFF Slate Award for Lifetime Achievement, Actor Lou Diamond Phillips (“Stand and Deliver”) with its Maverick Award, and actress Lea Thompson (“Back to the Future”) with its Diamond Award. There will also be presentations of CAIFF Slates to the winners of various categories ranging from Best Animated Short to Best Picture. Sunday’s events also include a special screening of the film, “Oklahoma” at the New Rheem Theatre. Its star, Oscar winner Shirley Jones, will be on hand to do a question and answer with the audience after the movie presentation. Another moving film from Barcelona, Spain, “The Frost,” will also be screened. It portrays an agony manifested by destruction and guilt. The accidental death of their only son, Rita and Alfred feel such remorse that they engage in a fierce fight of mutual destruction. Guilt confronts them with a painful recognition: obsessed by their selfish little needs, they forgot to love their son. As truth is revealed, all their inner demons are unleashed. They haunt and prick them on a road to hope or to damnation, whilst they desperately try to make amends for all those things they left undone in the past. The festival continues to screen more films from the Bay Area and beyond in the next three days (Jan 31st –Feb 2nd, 2011). On Thursday, Feb 3rd, 2011, the week-long festival culminates with a closing night reception and a special feature presentation of “Mayor Cupcake”. The star of the film, Lea Thompson, will be in attendance to do a question and answer with the audience after the movie presentation. To learn more about the California Independent Film Festival and to purchase tickets, visit the festival’s website (www.caiff.org) or the New Rheem Theatre Box Office at 350 Park St., Moraga, CA. (www.thenewrheemtheatre.com). For enquiries, call 925.388.0752 or e-mail info@caiff.org. “A filmic conversation is universal and transcends cultural barriers. It depicts a language that is spoken by all. This is the core of the California Independent Film Festival’s commitment to inspire, to educate, and to entertain film lovers from around the world.” – Beau Behan, Festival Program & Promotion Director. The 13th Annual California Independent International Film Festival (Jan 28th- Feb 3rd, 2011) is presented by the California Independent Film Festival Association, a nonprofit arts and educational organization dedicated to furthering the art of independent filmmakers. 2011 sponsors include the Winchell Family, Murdy Foundation/David Trotter, Diablo Magazine, Walnut Creek Marriott, CouldB Music, Senior Solutions, La Morinda Weekly, Caldecott Properties and the New Rheem Theatre.